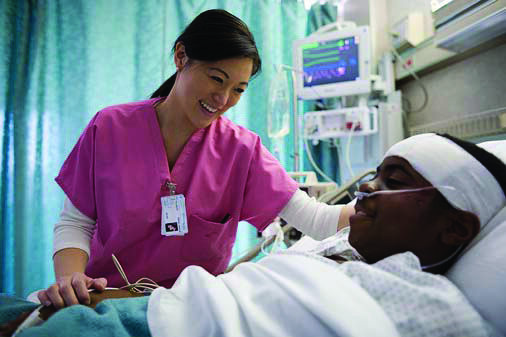 Nurses are often described as the backbone of all hospitals and other healthcare facilities. They’re the people who spend most of their time bed-side with all different types of patients whom are often stressed-out, uncomfortable, and frustrated for having to be there. This type of scenario can sometimes lead to unsafe and potentially life-threatening situations. While attacks on nurses and other healthcare personnel don’t happen every day, when they do occur, they can be sudden and serious. Last week, a patient being treated in a South Carolina hospital was arrested for assaulting 14 staff members. The attack began when the 29-year-old male patient became aggravated at a nurse trying to administer his medication and threw a cup of ice at her. The situation quickly escalated with him attacking other hospital personnel trying to support the situation. Luckily, none of the nurses were seriously injured and the attacker was charged with multiple counts of third-degree assault and battery. Unfortunately, these types of attacks are happening more regularly. St. Peter Mental Health Hospital in Minnesota, conducted their own internal research study to see just how often attacks on staff were occurring in their facility. The results from a year-over-year comparison were shocking. In 2011, there were a total of 78 reported assaults; last year, there were 173. That’s nearly a 125% increase in only 3 years. To make matters worse, 2015 is projected to surpass the number of attacks that took place last year by nearly double. According to the federal Bureau of Labor Statistics, half of all nonfatal but serious injuries occurring in the workplace happen in healthcare and social service settings. This statistic is estimated to be much lower than the true number of healthcare staff attacks as only the serious incidents get reported. It’s a common misconception in the nursing community that assaults are part of the job, especially in psychiatric units and nursing homes where patients are often disoriented and confused. It’s extremely important that healthcare facilities ensure the safety of their employees. Not only does it improve work force moral, it ensures that nurses and doctors aren’t distracted by the stress of their personal safety. So what can hospitals do to better protect their healthcare workers at all times? While the most obvious solution may be to hire more security guards, there are some major downsides to that. As great as security guards can be, it’s impossible for them to know the minute a dangerous situation is happening, and sometimes there isn’t much time between a threat and a full-scale assault. In order to truly protect staff members, there needs to be a solution that can alert others to help the moment a situation spirals out of control. Too many security guards walking around a hospital or other healthcare facility also gives off a very rigid and cold feeling – sort of like being locked up or in a prison. This isn’t something patients want to feel, especially in their already uncomfortable and vulnerable states. The best solution to ensure the safety and well-being of healthcare personnel is to implement a staff duress and panic alerting system. This type of wireless security solution protects healthcare personnel by enabling immediate response times during emergencies by instantly locating the specific employee under duress. With either a wall-mounted device or a small staff badge that can easily be hidden behind an employee ID badge, a nurse or doctor could discretely summon help if faced with a threatening situation or is in need of assistance. To learn more about clinical-grade staff duress and panic alerting solutions and how they can help protect healthcare staff members against threatening and dangerous situations, visit our page on Staff Security & Protection.